I signed up for a silhouette exchange as practice for me to do silhouettes with my EQ7 program. Kari Schell of On Point Quilter was kind enough to host this event. All we had to do was do a silhouette of any of our choosing and submit it in to her.. 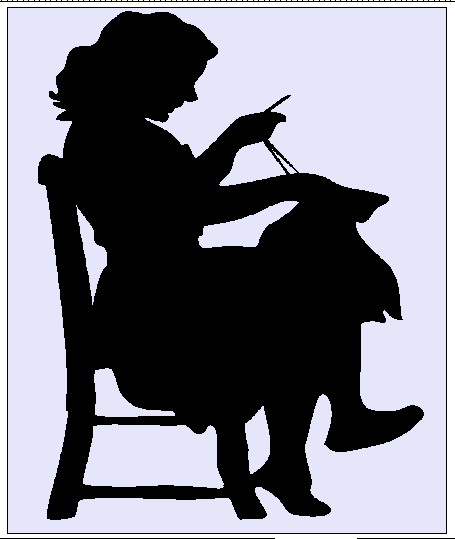 I happen to choose this woman sitting on a kitchen chair doing hand mending. How did I do this with the EQ7 program? Here is a description of the steps that I took to get to this image. Create new project. I called mine hand stitched. for this tutorial we will call it silhouette. Turn off all snapping options and grid. Chose your image. I chose Barnaby. and Open.and Ok. Double Click onto the block surface. Choose how it will fit in the block using these icons. Then adjust how much your image shows up using this tool. Go to the applique tab at the bottom of the screen. Choose the free hand tool. and trace the shape of your image. it does not have to be perfect as we will adjust in abit. Once it is traced use this icon to make sure your shape is closed. and it will fill in with color. this is what mine looks like now. Adjust the freehand lines by using the shape tool by double click on a line and move it around to where you want it. the blue bars are to lengthen or shorten the lines they also change the angle of the curve. You may want to enlarge the sections your working on so that it is easier to see. Once your happy with your result you can go ahead and go to the color tab and color . shape in. this was not the best choice of an image but it gives the just how to do this. Really nice! I need to practice my EQ7 skills more often. I’m sure I don’t use a tenth of what it can do. in august will be my one year of having my program I’m still learning it also. I don’t think we will ever know everything.